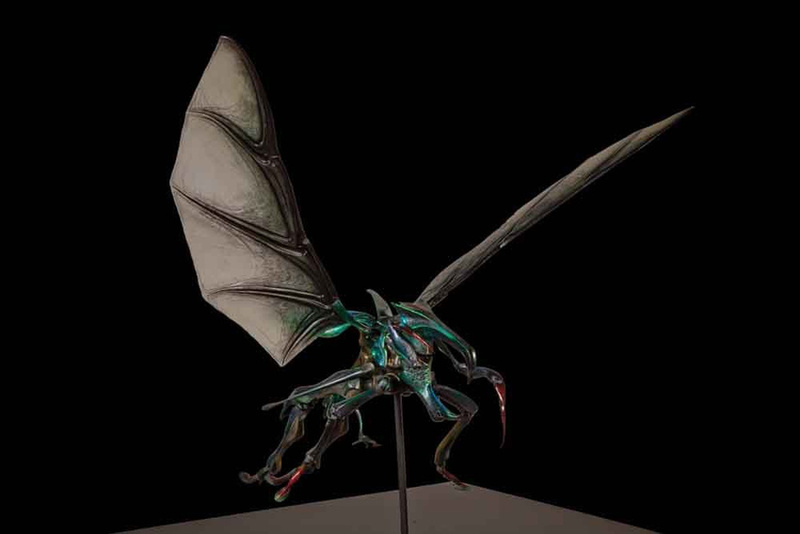 The digital model of the Warrior Bug. 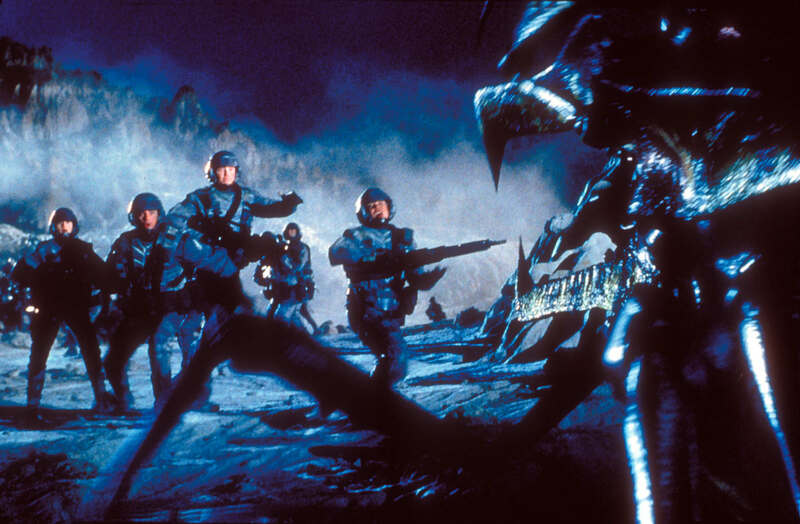 For Tippett, Starship Troopers represented an opportunity to advance the computer animation techniques whose foundation was made during the production of Jurassic Park. 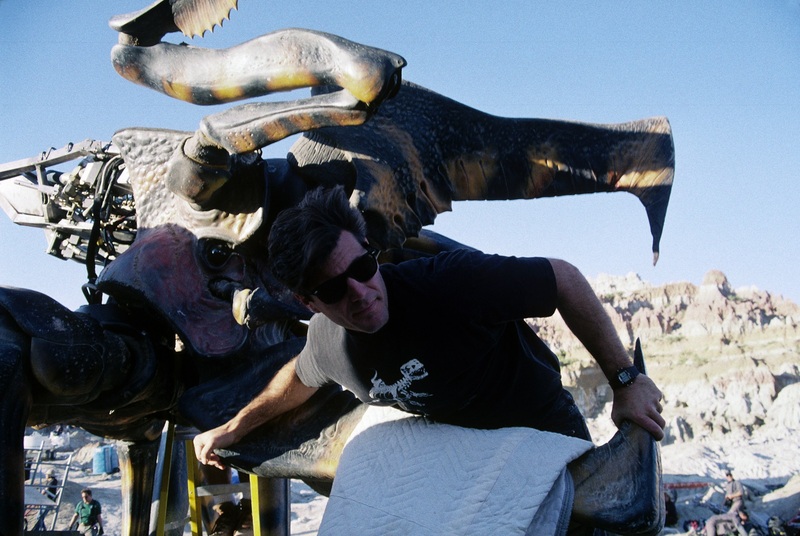 He said: “prior to Jurassic Park, I’d produced stop-motion mostly through traditional methods — by incrementally moving and photographing three-dimensional puppets on a frame-by-frame basis. But our studio’s dinosaurs for Jurassic Park were not created traditionally. Instead, a special piece of equipment, the Digital Input Device, was developed for that picture by a talented guy named Craig Hayes. The DID is a metal puppet armature, rigged with electronic sensors. The sensors record movement information on a controller box that translates it for computer use. 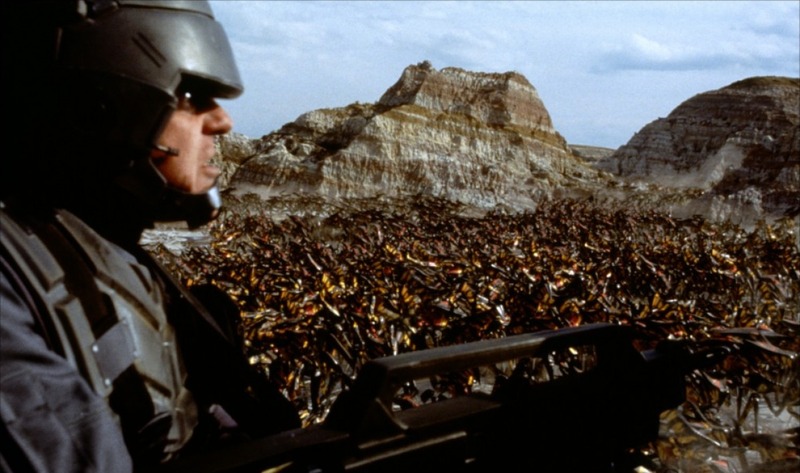 When an animator moves the armature by hand, those movements are mimicked by wire-frame representations inside a digital environment.” Essentially, Tippett realized that Starship Troopers was the chance to improve those effects in fields such as software, hardware and render time. 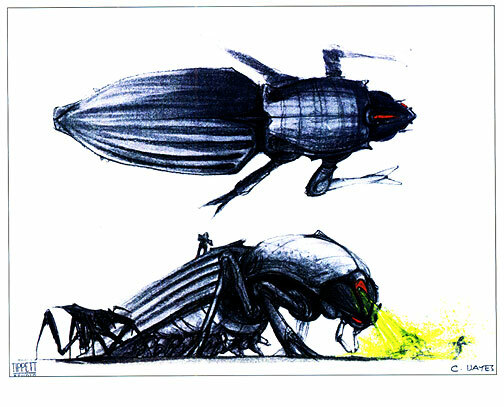 Before any animation began, the effects team focused on designing the castes of Bug society, based on the original story. 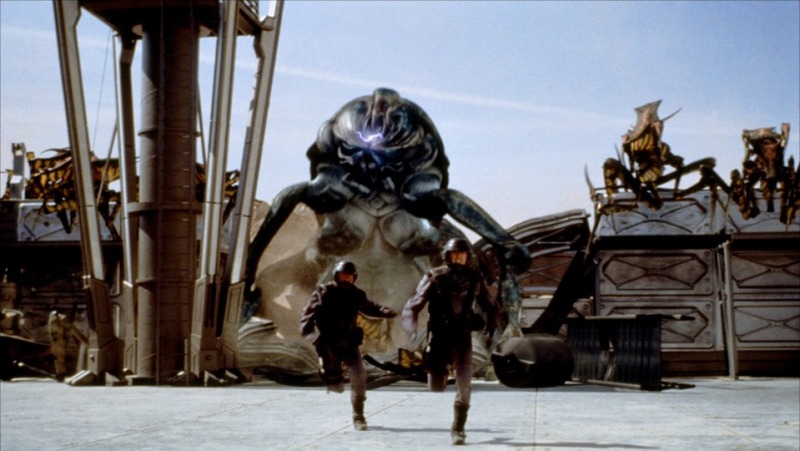 Heinlein’s Starship Troopers portrays a dystopian future, where humanity engages in war with an alien civilization — the Pseudo-Arachnids of Klendathu, also derogatorily labeled as ‘Bugs’. Despite their apparently primitive appearance, the creatures have advanced technology at their disposal, being able able to conceive and build spacecraft and weapons of war (“stupid races don’t build spaceships”). The Bugs’ society is hierarchical and caste-based. A Queen is the progenitor of a specific colony. The novel never describes this caste detailedly, and goes no further than mentioning that its purpose is that of an egg-layer. Strategic administration of the society is a task assigned to the Brain Bugs, which — despite their enormous intelligence — depend on lower castes to survive. In fact, they are described as having “barely functional legs, [and] bloated bodies that were mainly nervous system,” and are telepathically connected with the lower castes. The basis of Bug society is composed of the Warrior and Worker classes: the Warriors are “biologically incapable of surrendering,” and move forward in battle with energy weapons. Workers are generally assigned to manual labour — even though they can also be strategically used as decoys by other castes (such is the case during the invasion of Planet P). Even after the initial approval of the project, the studio executives were uncertain as to how the creatures could be efficiently brought to the screen. To erase those concerns, Davison convinced the executives to fund a “Bug test” — on a $225,000 budget. 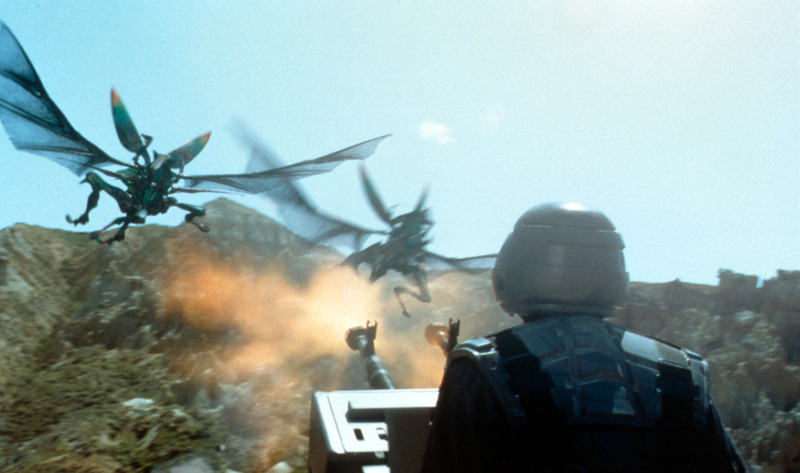 The footage was not only crucial for further development of the film, but also a chance for Tippett Studio to establish how to render the creatures — especially the Warrior Bugs themselves, whose design was finalized by the time the test was filmed. 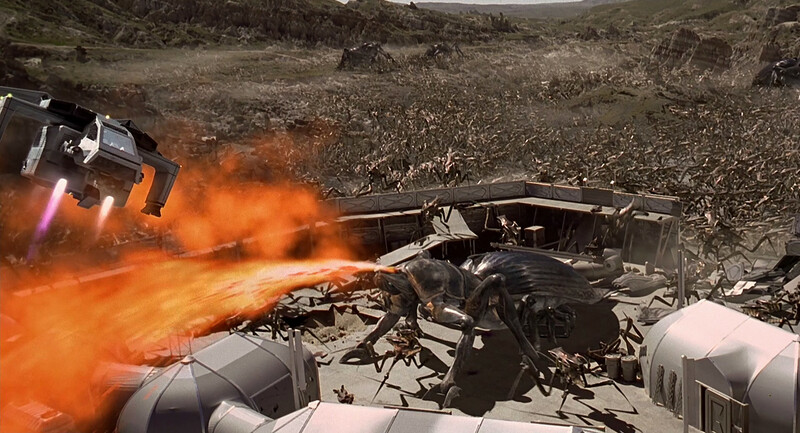 The test footage was screened for studio executives, and proved that the Bugs could be successfully brought to the screen. Tippett recalled: “we went to pitch it and it went up the food chain at Sony, and showed them what we were doing. They would worry about things like, ‘where’s the mouth on the bugs?’ We’d go, ‘It’s that little hole there.’ They’d be like, ‘well, how do they eat?’ We’d say, ‘well, they eat sap from the queen back in the cave.’ They’re like, really? But if they don’t have mouths, they can’t kill people.’ I go, ‘no, they’ve got these big beaks that can chop people in half, and they’ve got these things that can skewer them, so they just kill people. They don’t eat people. They don’t care about people.’ Then we had to go through the hierarchy of screening for three different executives, and at that time Mark Canton was the head of the studio. He brought his entourage in, and they looked at it, and he turned around and said, ‘Well, is this movie going to be fun?’ We’re like, ‘Yeah. Sure, it’ll be fun.’ So he said, ‘Okay, go ahead and make it. 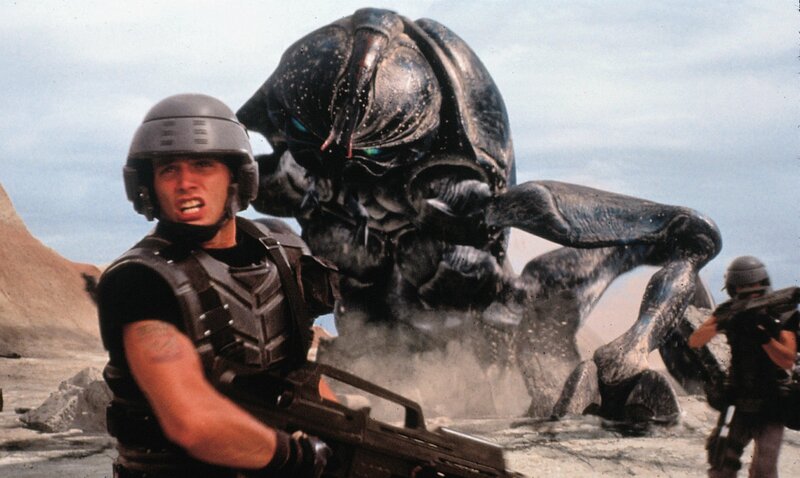 '” Starship Troopers was greenlit. 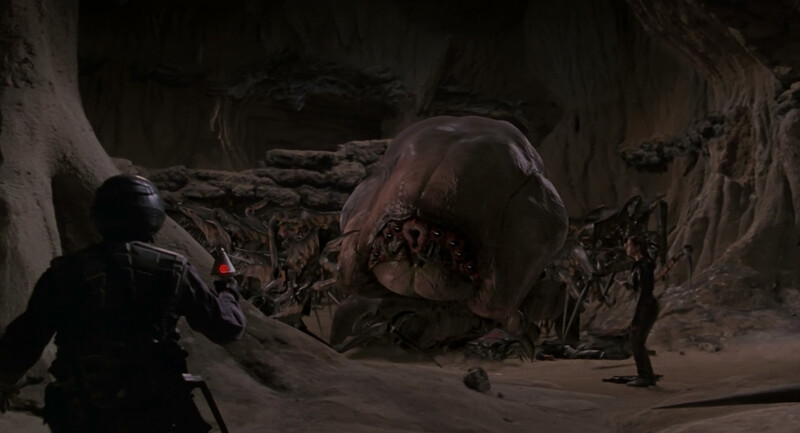 Compared to Tippett’s earlier effort in photorealistic digital creatures — Jurassic Park — Starship Troopers presented considerable challenges: not only it required a far more massive number of digital effects, but it would represent fictional entities without an actual point of reference from reality. Tippett explained: “we’d had concrete reference points for [the Jurassic Park] dinosaurs; and when the weight and the joints of a real animal — even an extinct one — are available to you, you pretty much know what to do with it digitally. But when you’ve got something that’s never really existed, such as the insects of Starship Troopers, suddenly the tail is wagging the dog. 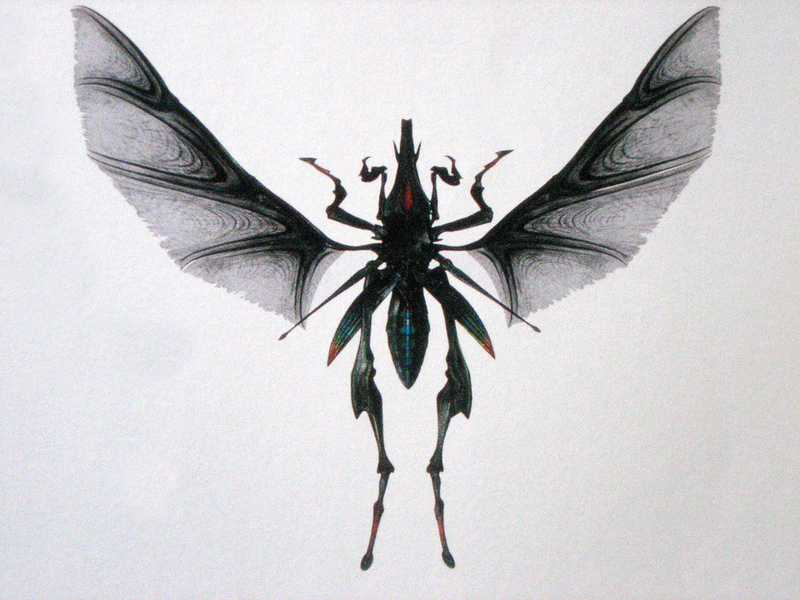 We had these great Bug designs that Craig had come up with, but trying to figure out what these creatures could do — what, for them, could be a realistic gait, or a lifelike action — became an enormously complex enterprise.” In addition to that, the creatures would be shot in full daylight for most of the film, rendering the process even more challenging. 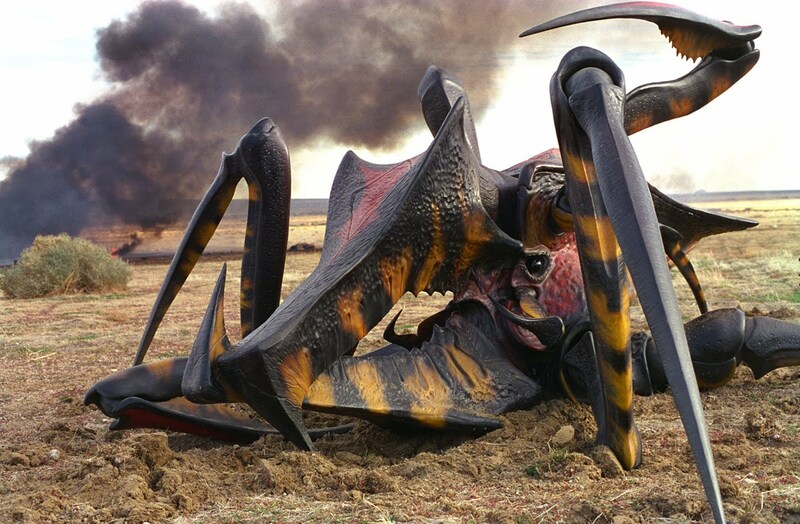 At least one hundred digital artists — from animators, to compositors, to other technicians — worked on Starship Troopers to bring the Bugs to life. Each animation sequence started with a series of low-resolution animatics. Digital scans of the maquettes sculpted by Peter Konig and Martin Meunier provided the wire-frame of the models, which were then finalized. An exception to this was the Tanker Bug, who was created in Softimage by Blair Clark without going through the digitizing process. All models were then refined in Softimage, and set up with kinematic chains, which enabled them to be animated. Paula Lucchesi and Belinda Van Valkenburg were responsible for the color scheme and surface texture of the creatures. Two animation techniques were used by Tippett’s team: for the most part, key-framing animation was used, including the entirety of the sequences involving the Tanker Bugs, the Hopper Bugs, and the Brain Bug. 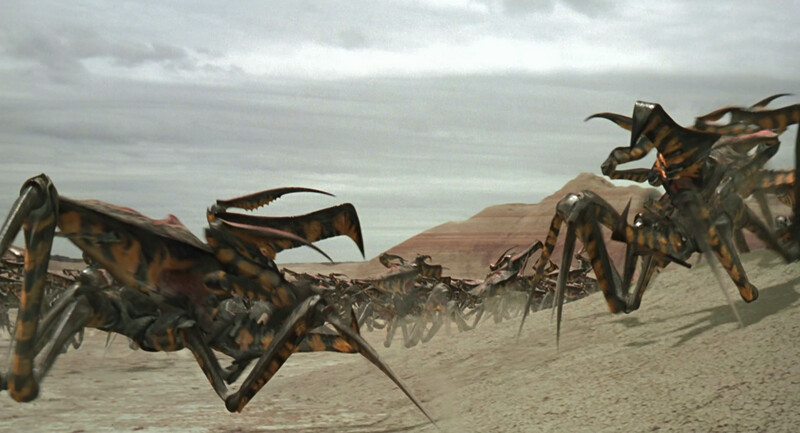 A considerable number of sequences involving the Warrior Bugs also used the Digital Input Devices (DID, originally standing for Dinosaur Input Device), a Tippett Studio invention first experimented in Jurassic Park and Tremors 2: Aftershocks, built by Merrick Cheney in the shape of the Warrior Bugs. The DIDs are small-scale articulated models, fitted with motion sensors that transfer the movement applied on the DIDs to the digital models being animated. 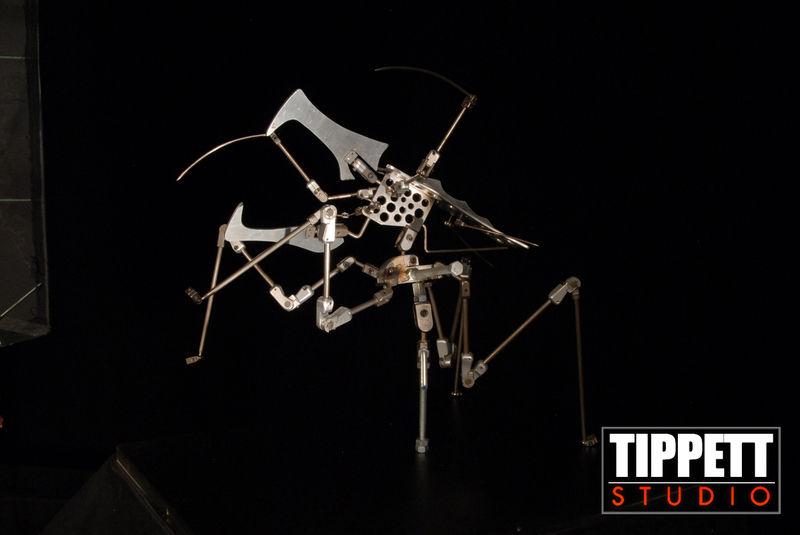 One of the Bug armatures used during the animation process. The Arkellian prop on set. 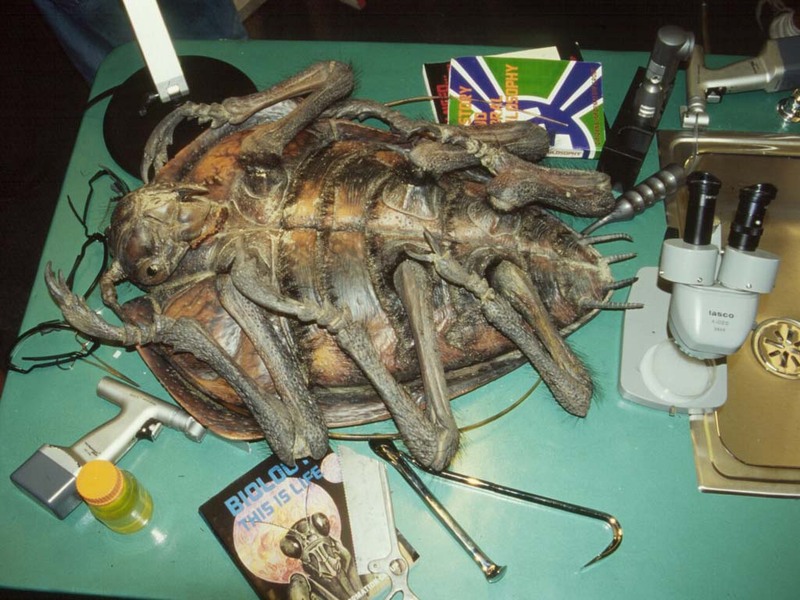 It is actually an ADI creature effect first appearing in the film: the Arkellian Sand Beetles — seen on autopsy tables as part of a biology lesson (hence their production nickname of ‘Dissection Bugs’). Eight three-feet long, two-feet wide creatures were built; each one was composed of 12 main parts, among which the head and legs — moulded in translucent skinflex, a more flexible type of urethane. The body was instead moulded in urethane. Among the props, one was a hero Beetle which could be filmed in full detail; it was painted with acrylics and detailed with horse hairs (each individually ‘punched’ into the skin). Its insides were rendered with ultraslime, methocel and nylon — other than silicone organs. 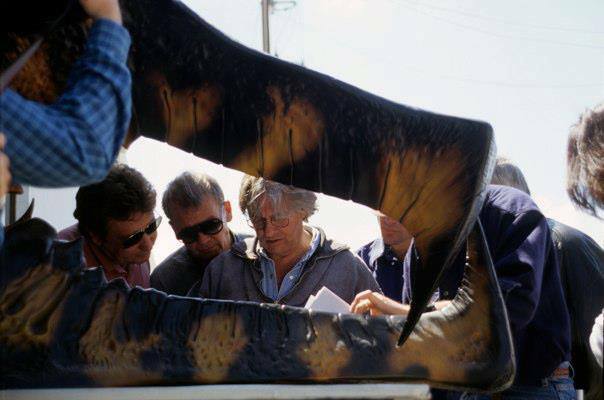 The internal structure was held together by a thin silicone membrane placed under the urethane abdominal shell, which was severed during filming to simulate the dissection. To create the effect of pressurized internal organs, a simple internal air bladder was inflated manually with an air rig. The Warrior Bug maquette, sculpted by Peter Konig. The most articulate sequence employing Dynamation was the Whiskey Outpost attack, one of the first to be taken on. Epps recalled: “on any effects film, we like to get the big shots out of the way first. Anything you learn at the front of the schedule makes subsequent shots of the same nature a lot easier to accomplish. So we tackled the first two swarm shots in that sequence right away.” Nearly a dozen swarm shots was made for the sequence and carefully detailed to be as realistic as possible, such as dust or shell parts being blown off. 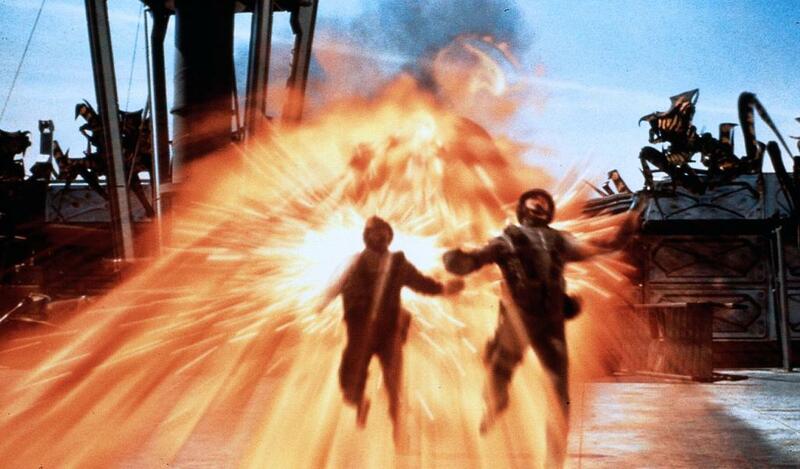 “These elements were either CG or real elements filmed against greenscreen,” said Doyle. 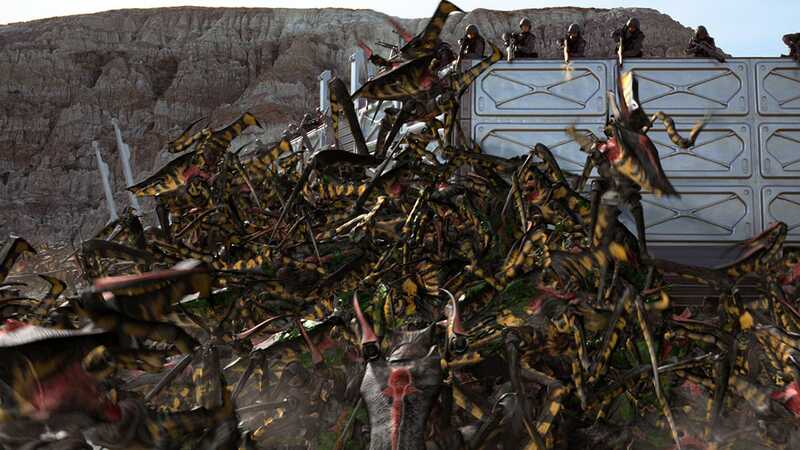 “The dust kicked up by the Warriors was a separately photographed element, as were a lot of the squib hits and gore effects you see on the Bugs.” The second swarm did not have to move in separate paths; as such, “instead of run cycles,” Epps said, “the animators set up ‘milling about’ cycles, which were inserted over the Dynamation-generated Bug dots.” Rendering time for the swarm shots clocked in an average of 60 hours per frame first, then 25-30 hours as the crew became accustomed to the process. ‘Snappy’ with Alec Gillis on set. 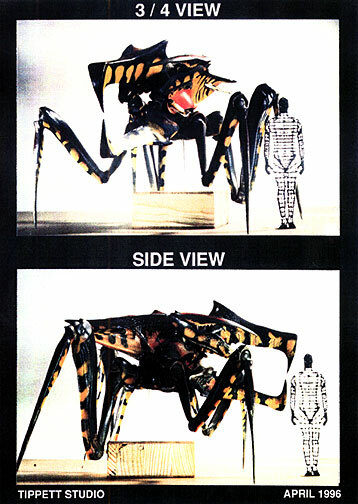 Two full-size animatronics of the Warrior Bugs were provided by ADI. They were engineered by George Bernota, and based on full-size sculptures by Steve Koch and Brent Armstrong. Their shell was moulded in fiberglass and painted; soft skinflex portions were the finishing touches, and covered jaw, wrist, elbow, and shoulder joints. Both were driven by a combination of pneumatic, cable-controlled, and hydraulic mechanisms. ‘Snappy’ — nicknamed by the crew after its articulated jaws — was an insert upper-torso animatronic, detailed from the shoulder area to the head. The nine-feet tall puppet featured fully articulated front legs, arms, jaws, and eyes, and was hydraulically operated for head rotation. In order to properly lift actors as certain sequences requested to, its internal structure was built in steel. A collision avoidance program also prevented the puppets from damaging themselves. Where Snappy only needed three puppeteers, the other animatronic — a full-body creature, nicknamed ‘Mechwar’, needed five. Measuring a total of 15 feet in length and 10 feet in height, Mechwar was able to perform a wide range of at least 30 separate movements. Its head was hydraulically powered — as was its thorax, which combined hydraulic, pneumatic and electrical systems. The jaws and arms were puppeteered with cables and hydraulics, whereas the legs were maneuvered via rods. 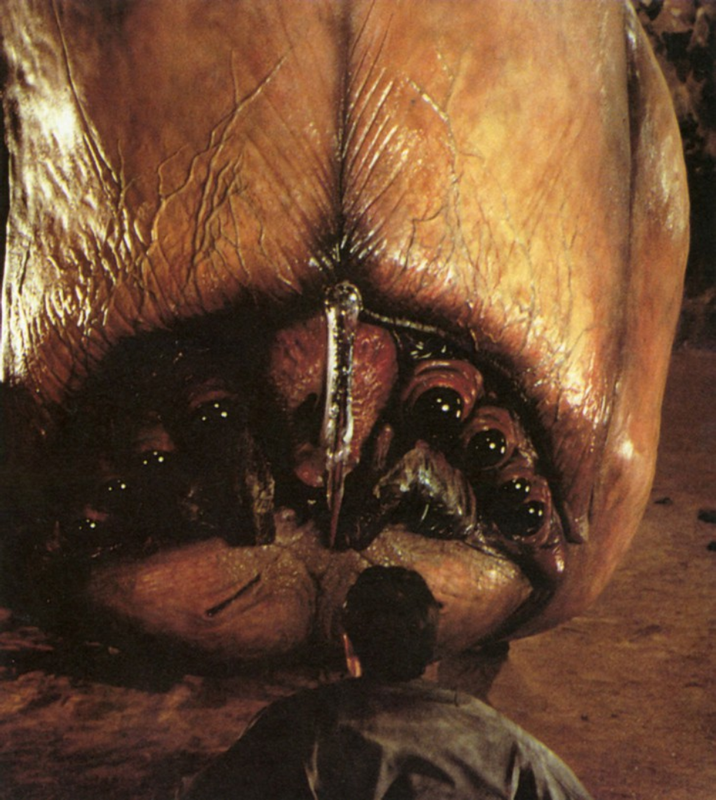 Head, jaws, arms and the creature’s smaller parts (such as the eyes) were puppeteered separately. The controllers were custom-made small-scale armatures that corresponded, section for section, to the full-scale animatronics. Fitted with motion sensors, similarly to Tippett’s DIDs, the devices could transfer the movement applied to them onto the puppet. Gross body movements were provided with a simple support crane attached to the Bug’s thorax. Built by John Richardson’s department and operated by eight crewmembers, it could perform upward, downward and rotational movement. Numerous full-size models were constructed to portray dead Bugs. 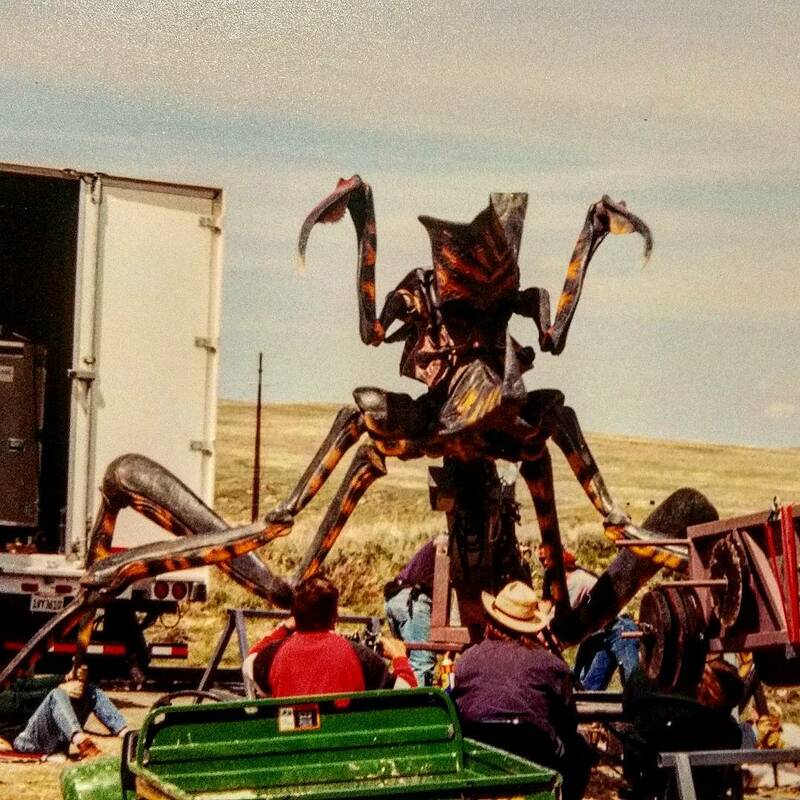 A total of 15 props portraying the deceased Warrior Bugs was built: five charred creatures and ten bloody carcasses, riddled with gunfire. Co-founder of ADI Alec Gillis said that “those were scaled-up from the maquettes, moulded in silicone, seamed, and cast out of fiberglass. We decided to do the full-scale Bugs modularly in order to quickly pop them together as needed, and each Bug was broken down into 34 separate pieces. We also made backup pieces, in case of location damage. With 34 pieces for each dead Warrior, multiplied by 15 dead Warriors, multiplied by backups, just manufacturing these things turned into a huge job.” Other minor creations were insert arms. 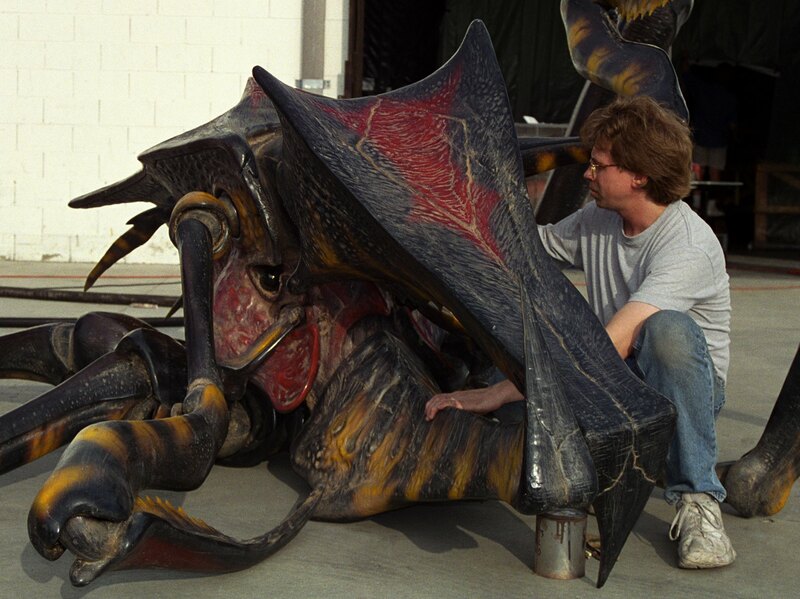 Made of fiberglass and four-feet long, the appendages were maneuvered offscreen via handles on the shoulder end. 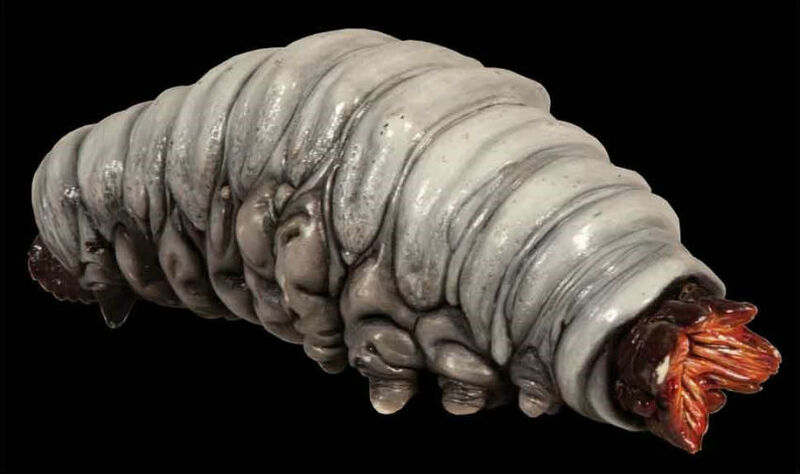 The Bugs’ entrails were created with a combination of chopped latex and foam rubber scraps. 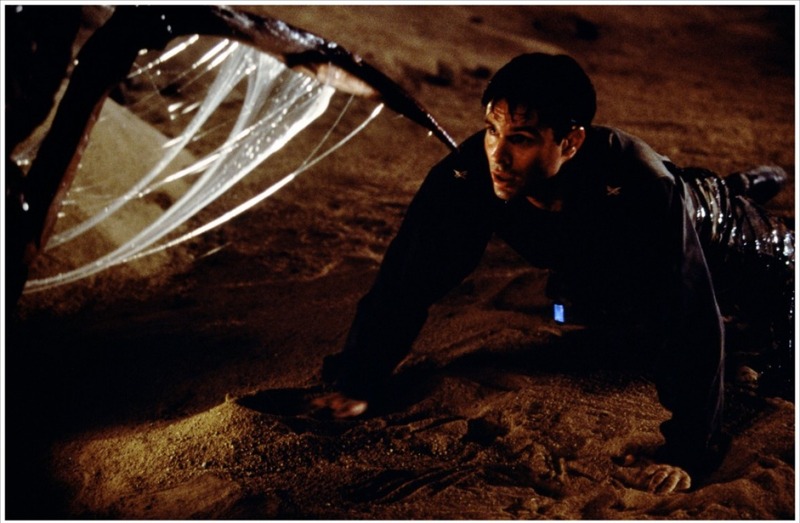 The blood was instead methocel, tinted green, orange — in the case of the Tanker Bugs — or cream-like — in the case of the Brain Bug (the reason for the different coloring within the same species was not addressed — neither within the film nor by the filmmakers). The Warrior Bugs in ruin. The Plasma Bug represents the heavy artillery of the Bugs: by rearing its weaponized abdomen, it shoots plasma projectiles into the sky of Klendathu. Hayes said: “we spliced together the biologies of real stink bugs and fireflies to come up with the Plasma Bugs — gigantic creatures that could eject plasma from their lower abdomens into a planet’s upper atmosphere, resulting in spaceships being knocked out of orbit or asteroids off course. The Plasma Bugs became the heavy artillery of the aliens.” Due to their size, their limbs are proportionally thickened; and since the plasma projectiles are ejected from their enormous abdomen — the last pair of limbs is bigger than the others, in order to lift the ‘biological cannons’ into a stable upward position. 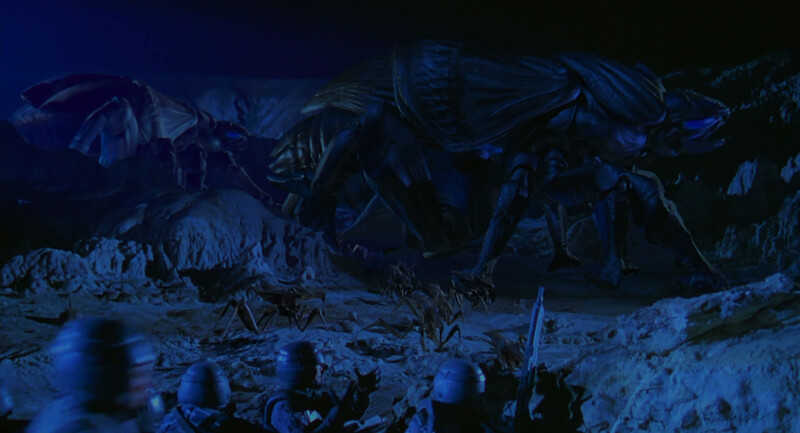 In the early encounter with the Plasma Bugs, the creatures are seen ejecting their deadly weapon into the skies of Klendathu. 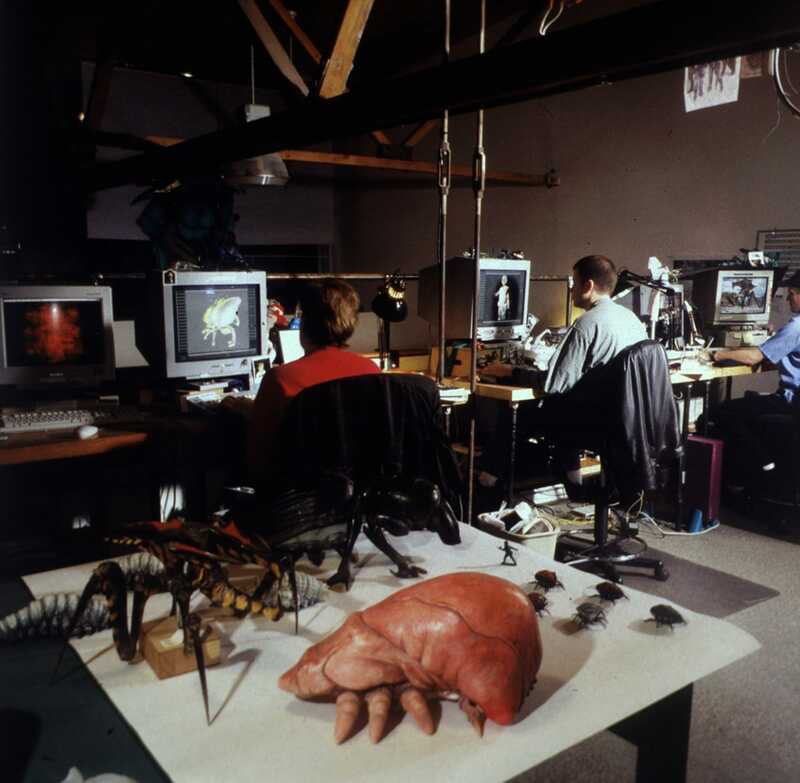 Layers of computer-generated transparencies were provided by the art department to render the translucent abdomens of the creatures, with the plasma projectiles rendered with RenderMan and Dynamation. 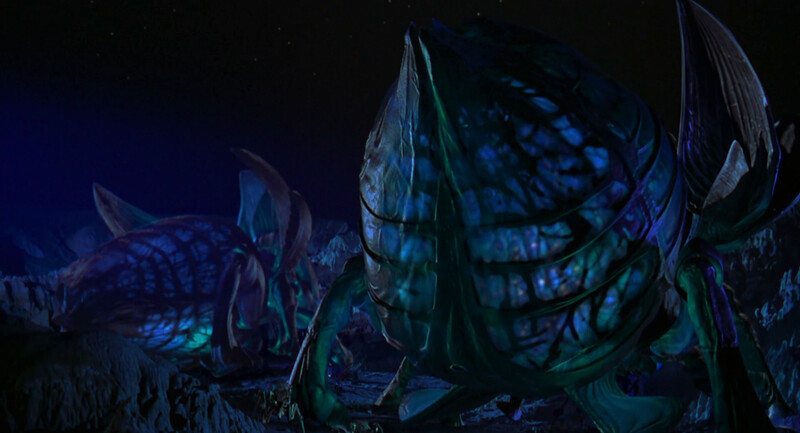 A deleted scene from the film showed that the Plasma Bugs’ projectiles were energy-charged larva-like Bugs; the grub-like design devised by Hayes was even sculpted in full-size by the ADI crew, but the sculpture was left unused. The impressive Tanker Bug is an enormous armoured beetle-like creature with a lethal long-range acid spray; it represents World War II tanks. “They’re [like] half-track tanks,” Hayes explained. 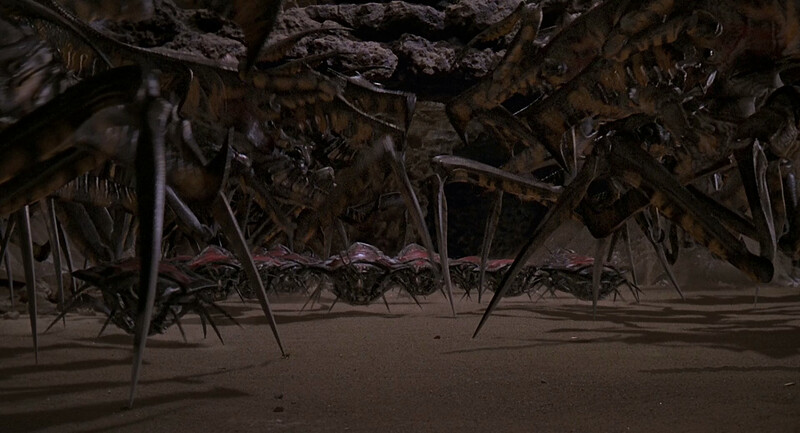 “They have multiple legs — a big set up front, and then a row of six small ones. They’re mobile plasma sprayers, like flame-throwers.” The structure of the Tanker Bugs is mainly inspired by earth beetles, with thickened locomotory limbs to support the creature’s mass. Tanker Bug concept art by Craig Hayes. The Tankers also have enlarged claws or toes to aid their stability when walking. Their name is derived from their organic long range weapon, violently ejected from an orifice in their forehead region: a flow of “corrosive acid ignited by organic sparkers near their mouths, spewing out a cross between an acid bath and a flame-thrower.” The final design applied cosmetic changes in regards to the maquettes — such as an additional pair of locomotory limbs. The Tanker Bug shell on set. 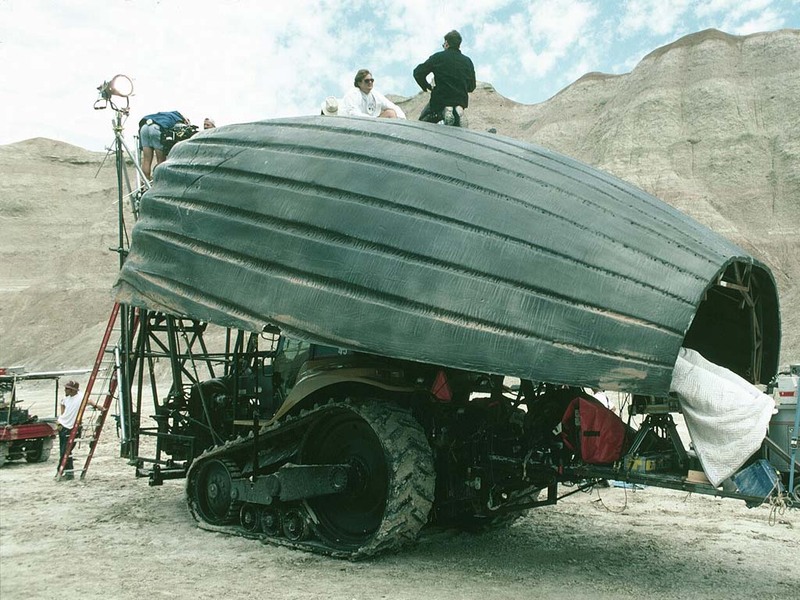 For the scenes where Rico is seen on the back of the Tanker Bug, ADI constructed two fiberglass shells, sculpted (in green foam) as well as painted by Bob Clark. They were joined together to form the back plate of the Tanker Bug. The actor was attached to the shells with thin wire tethered to a belt. To portray the wild movements of the Tanker as Rico tries to penetrate its hide with gunfire, a twenty-feet long tractor was installed beneath the shell through a system of metal supports, hydraulic rams, and a gimbal. Two crewmembers puppeteered the shell. 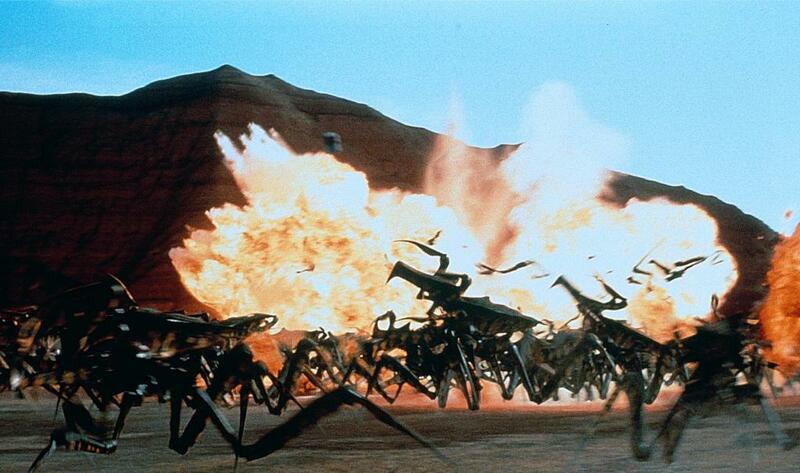 The air troops of the Bug army are represented by the Hopper Bugs, “capable of gliding on air currents and shearing off human heads.” The design was obtained by reverse-engineering the Warrior Bug design, with several changes and additions — such as the wings, appropriately large to support the creatures in flight; the legs, structured for long jumps (or ‘hops’) and for take-offs; and a less angular shape of the main jaws. 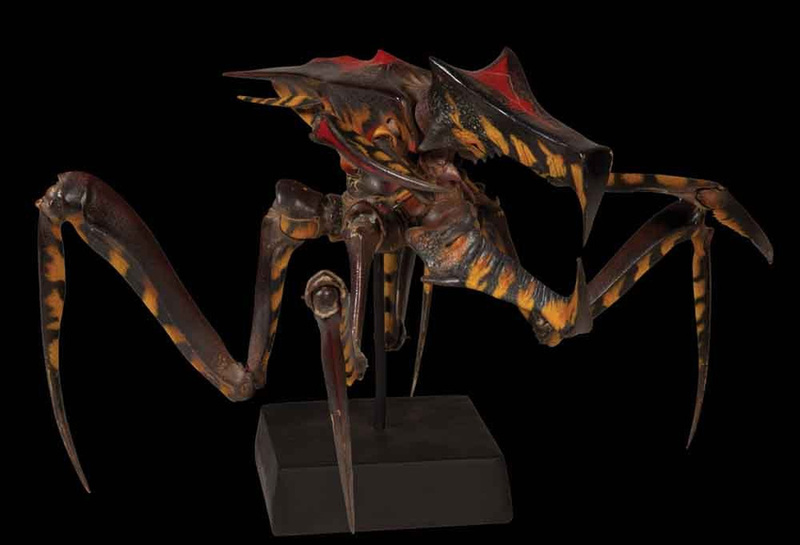 The Hopper Bug maquette, sculpted by Peter Konig. 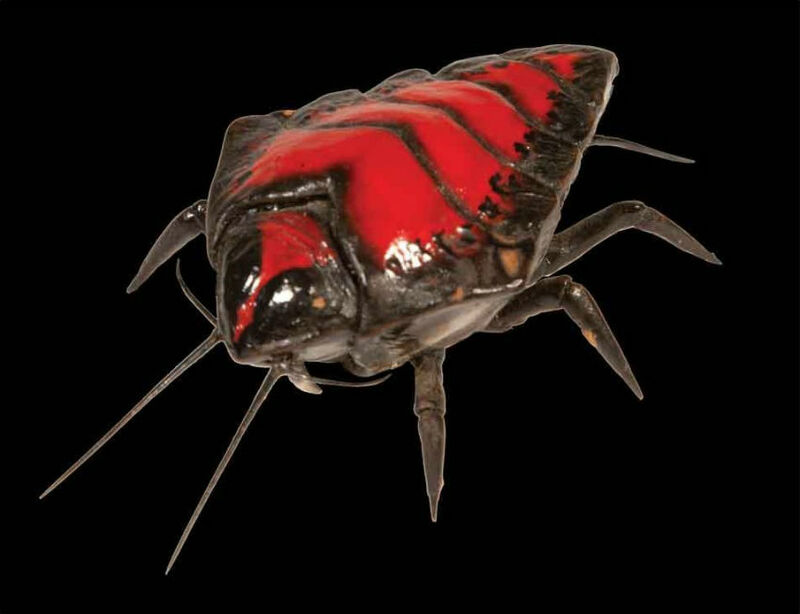 The Hopper Bug digital model in dorsal view. 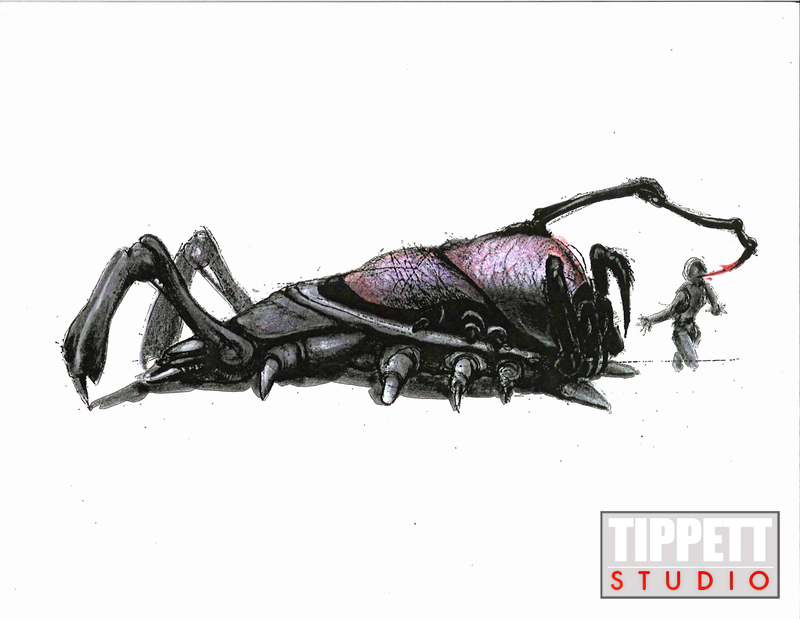 Concept art of the Brain Bug by Craig Hayes. Early concept art of the Brain Bug. 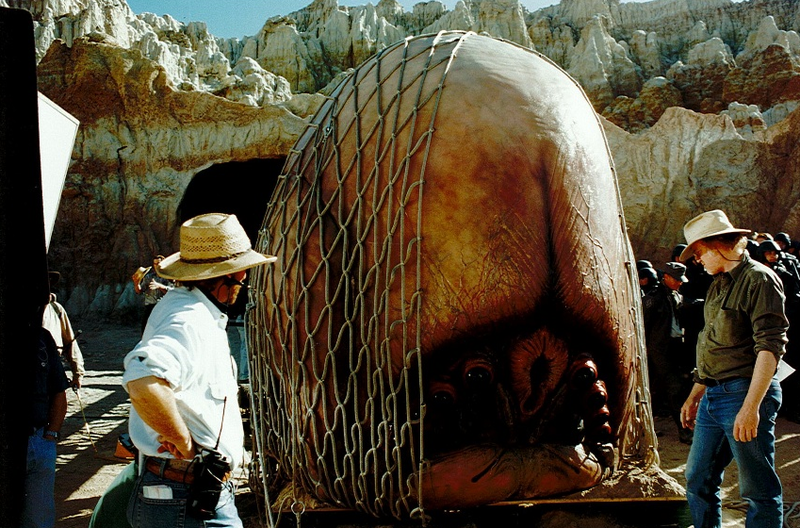 ADI constructed a massive insert puppet of the Brain Bug — the most ambitious practical creature of the project. Since the full body would only be brought to the screen digitally, only the head of the creature was built; it was 12 feet tall and 10 feet wide. The creation of the animatronic started with a full-size sculpture — in green foam and clay — by Bob Clark. The face of the Brain Bug was sculpted separately in clay and other materials by Steve Koch. The head was moulded in separate pieces of fiberglass, which were joined together to form the underskull. 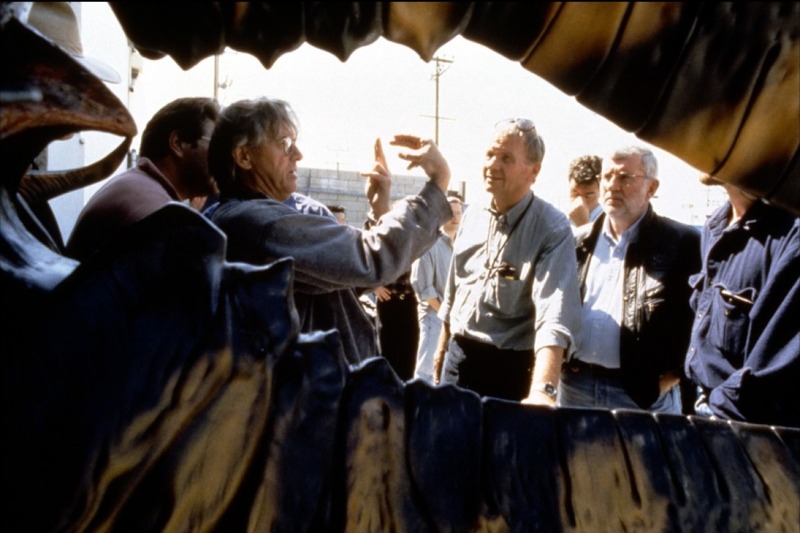 The structure was then covered with foam latex skin — again cast in pieces due to the sheer size of the animatronic. The face was instead moulded in skinflex and positioned over the articulation mechanisms. Steve Koch’s sculpture of the Brain Bug’s face. The practical version of the ‘meat wave’ effect was designed by David Penikas. 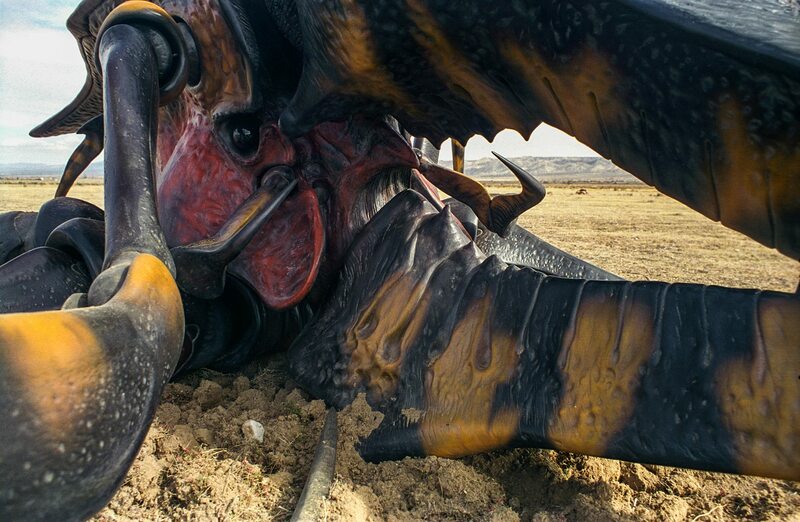 He engineered and built an eight-feet long and two-feet wide endless conveyor belt system, which followed the curvature of the Bug’s upper skull and was installed under the skin. Two rollers with gripping servomotors were placed on the creature’s brow area and on the back of the head, connected by the belt — which was covered with crescent-shaped pillows. A motor equipped with a speed controller produced the rippling effect by running the conveyor belt, whereas the pillows damped its actions. The creature was also supposed to express emotions through its bodily language. “One of Paul Verhoeven’s big concerns,” Woodruff said, “was that we be able to get a variety of expressions out of this face. That was one of the difficult challenges, to make it not only look fearsome but fearful as well.” Five puppeteers controlled the Brain Bug’s movements from inside the animatronic itself; gross movements of the entire head were provided by a support rig the puppet was attached to. The Brain Bug on set. The Bug’s segmented proboscis was puppeteered with cable mechanisms. Yuri Everson, part of the ADI crew, recalled: “we made a number of triple-jointed, cable-controlled palps, operated from inside the puppet head, through what looked like a little t-shaped motorcycle handlebar.” The exterior of the proboscis was moulded in translucent vacuform and then airbrushed. For the scene where Carmen severs it, a pre-cut tip was attached with superglue, and a hollow tube was inserted — to pump colored methocel, which simulated the creature’s blood spurting out. The brain-sucking effect seen when the Brain Bug kills Zander was a collaboration between ADI and Kevin Yagher Productions, the gore effects provider for the film. Technician Bryan Blair commented: “working alongside ADI, we did that in two stages. For shots where it’s obviously actor Patrick Muldoon looking horrified, we came up with a mohawk-type wig for him, with a fake silicone wound attached to the top of it. ADI took off the top of one of the hollow vacuformed palps and attached it to our fake wound and hair appliance. At the same time, we’d hidden flexible, hollow plastic tubing, about an inch in diameter, under Patrick’s hair. That tube trailed down behind his back and into a plastic bucket, where we’d deposited this sausage-like rope of silicone ‘flesh’ that was attached to a string and drenched in stage blood. We ran the string out the opposite end of the tubing and into ADI’s hollow spike. On ‘action’, Patrick started to grimace while I pulled the string, yanking the sausages up through our hidden tubing into the translucent spike, making it look as if Zander’s brains were being sucked through the palp.” The sequence was completed with two puppet heads of Zander, respectively simulating his pain as the palp pierces his head and his death. 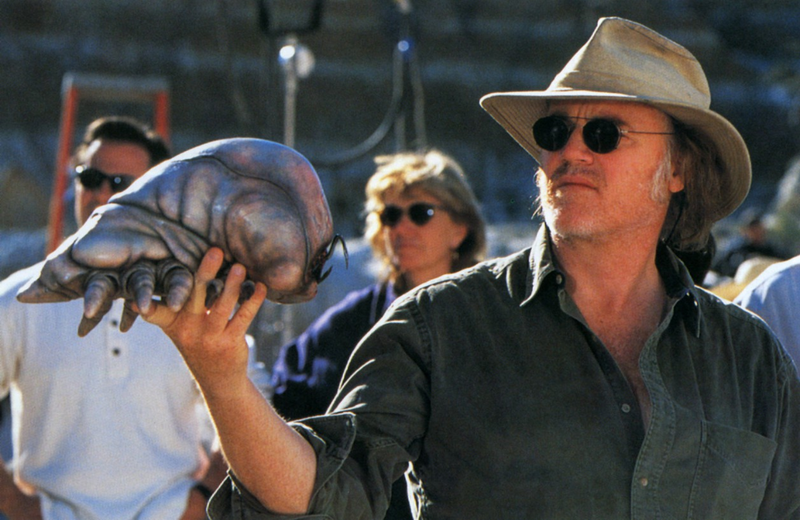 Phil Tippett on set with one of the Brain Bug maquettes for lighting reference. Would you like to know more? Visit the Monster Gallery. 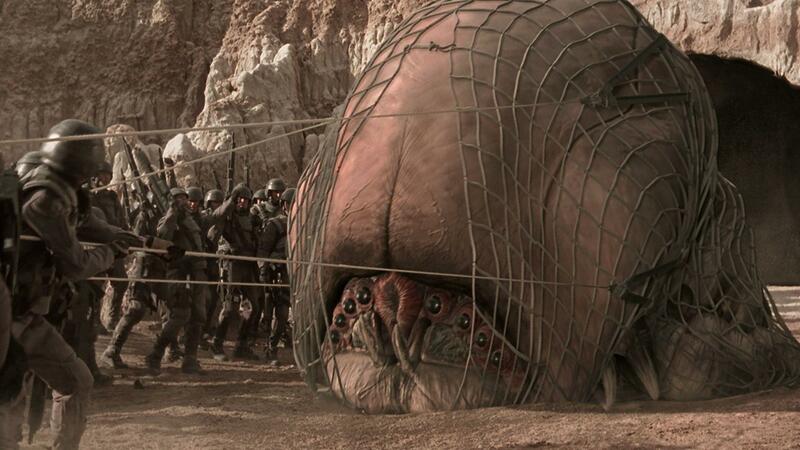 Posted on 07/07/2014, in Movie Monsters and tagged Amalgamated Dynamics, Phil Tippett, Starship Troopers. Bookmark the permalink. 6 Comments. Awesome that you’ve covered this film, it’s one of my favourites! Il film in sè non mi ha fatto impazzire,anzi.Tuttavia gli Aracnidi di Klendathu mi sono piaciuti molto! Se non fosse stato per l’articolo non mi sarei mai accorto che il “Bug Plasma” e il “Bug Thanker” fossero due tipi distinti di Insetti (credevo fossero la stessa tipologia),nè che i “Bugs Chariot” fossero i trasportatori dell’Insetto-Cervello (li avevo interpretati come larve di quest’ultimo). Peccati per i guerrieri alati,si vedono in un paio di occasioni e alla svelta. Il Romanzo è conosciuto in Italia semplicemente come “Fanteria dello Spazio”, puoi prenderlo comodamente su Amazon. Really great piece. I’m gonna go back and watch the movie again, now.